Doing some holiday shopping in New Orleans? You’re in luck. With new shops at Canal Place and outlets at Riverwalk, a trip to New Orleans is well worth a visit for a few days of retail therapy. Here’s a look at the best places to shop around the Big Easy. If you’re in town for a spell, check out rates at Hotel St. Pierre, located just walking distance from most shops on the list. Our French colonial cottages are a quiet reprieve near all the action of the French Quarter. The shops at Riverwalk is an indoor outlet mall located right on the Mississippi River in the Warehouse District, a quick walk from the French Quarter. Enjoy markdowns of 50 percent from top-brand retail outlets, such as Birkenstock, Chico’s, Neiman Marcus, Fossil, and more. This well-kept mall is great for finding name-brand products at bargain prices. It also offers excellent views of the river. 500 Port of New Orleans Pl. While in New Orleans, why not browse the racks at a converted brewery built in the 1890s? The Shops at Jax Brewery is an especially good spot to pick out souvenirs, which you’ll find a bit cheaper than at the French Market. Browse local art, Louisiana food seasonings, t-shirts and sports gear at this historic building located at the corner of Jackson Square in the Quarter. Make time to check out the free museum about the brewery, which was a city mainstay from 1891 to the mid 1970s. 600 Decatur St. 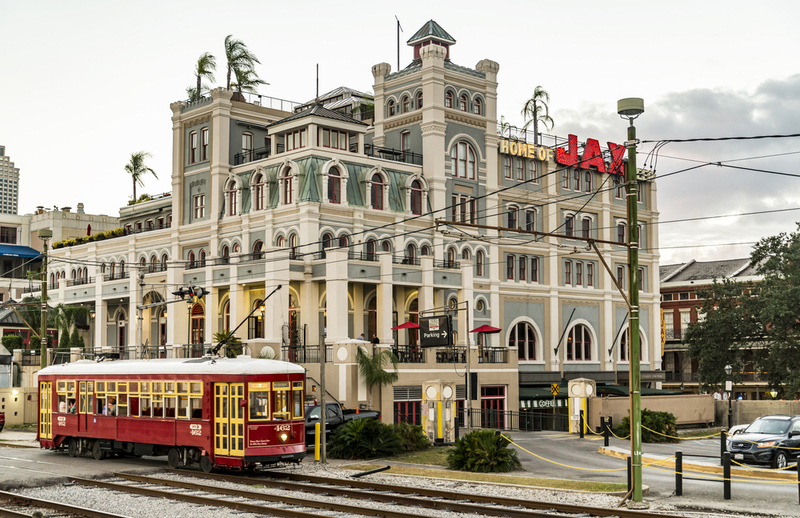 This upscale shopping center is located right at the edge of the French Quarter on Canal Street. The Shops at Canal Place has the latest from high-end luxury product stores. Anthropologie, Saks and Lululemon are just a few shops you can expect. There’s also a movie theater with drink service, reclining chairs, and a fair food selection. 33 Canal St.
For a mix of sightseeing and shopping – especially for unique, vintage items – Magazine Street is home to some of New Orleans’ most stunning residences, tree-lined streets, and independent shops. Check out The Shops at 2011 for gifts, jewelry and antiques, as well as work of local artists and designers. Search funky, unexpected shops where you’ll find eclectic momentos. Make a day of it using our neighborhood guide to Magazine Street. Check out rates at Hotel St. Pierre, located in the heart of the French Quarter.